Hard Cover, 336 pages, 6 x 8.5. Renowned beer sommeliers Hallie Beaune and Christina Perozzi offer a down-to-earth guide to craft and artisanal brews that celebrates beer for what it truly is: sophisticated, complex, and flavorful. Beaune and Perozzi cover everything from beer basics to the science behind beer, food and beer pairings, home brewing, and tips for perfecting one's palate. This edgy, no-nonsense guide exposes hidden truths, debunks every misconception, and reveals the power that comes with knowing an ale from a lager. "The Naked Pint is a great read for anyone interested in all things beer-from beer style descriptions to cooking with beer to brewing your own beer at home. Like a Beer 101 textbook to amp up your brew IQ, if only textbooks occassionally made you laugh out loud. The authors know their stuff; they understand and convey the notion that beer can be complex without being overly complicated, and they take beer seriously but don't take themselves too seriously. The Naked Pint is, um, revealing." "No one turns people on to beer the way that Christina and Hallie do. Along with their passion and expertise, they bring a wit and levity that exemplify the renegade spirit of craft beer." -Greg Koch, CEO and co-founder, Stone Brewing Co.
"I have always loved beer without knowing much about it. I learned a lot in this factual, enlightening, and funny guide to one of the oldest and most cherished beverages known to man." "Whether you want to brew at home, belly up to the bar with confidence, or make magical pairings at the dinnertable, The Naked Pint makes learning about craft beers as fun as drinking them. You'll be a savvy sipper after reading this educational and engaging book." "An incredibly satisfying read! This books gets better-looking on every page. 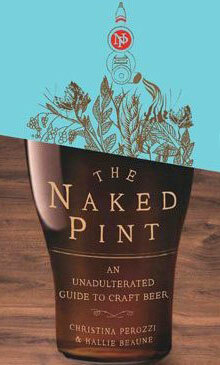 From Pale Ale to Weizen, The Naked Pint covers all of beer's finer points in a fun, witty, and approachable manner. Hallie and Christina's great taste and cool, refreshing style is the perfect introduction to the often intimidating world of craft beer."